efficient way to study for the NAVLE®. your secret weapon for passing the big test. The information in this section is optional, though we'll be able to improve your study experience if you do provide it. You can add/update it at any time in your account profile. BY COMPLETING THE REGISTRATION PROCESS, YOU ARE STATING THAT YOU ACKNOWLEDGE THAT YOU HAVE READ THE MINIMUM HARDWARE SPECIFICATIONS REQUIRED TO RUN THIS PROGRAM AND YOU AGREE TO BE BOUND BY THE TERMS AND CONDITIONS OF THIS AGREEMENT. I have read this document and understand and agree to its terms. It looks like your email is already registered with VetPrep. © 2019 VetPrep · All rights reserved. VetPrep is confident that anyone who completes the VetPrep course will pass the NAVLE® on their first attempt. If you completed the entire VetPrep course and still do not pass the NAVLE®, VetPrep will pay for your next VetPrep subscription. In order to qualify for a free re-subscription, you must have completed the full VetPrep course by finishing all practice questions and timed exams before the date of your exam. If you do not pass the board exam, contact VetPrep support for instructions on how to submit the materials necessary to process your re-subscription. VetPrep Certified™ Content must go through a rigorous approval and review process before release. This is followed by continuous peer review as well as statistical item analysis to ensure validity, relevance, and accuracy. 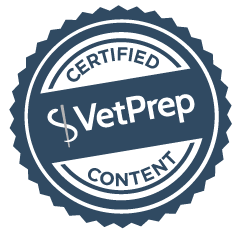 VetPrep Certified™ Content Contributors: VetPrep content contributors include preeminent veterinary specialists, experienced practitioners, as well as recent graduates to ensure that our content stays up-to-date and relevant. The characteristics shared by all content contributors are great writing skills and dedication to providing the very best veterinary board review content. VetPrep Certified™ Content References: The references for VetPrep Certified™ content are trusted resources used by veterinary professionals. VetPrep Certified™ Content Approval: When new content is submitted for incorporation into the VetPrep learning module, it must undergo several layers of review and approval before it is made live at the website. A specialized portal was created for writers to submit questions, answer choices, and detailed answer explanations. Once complete, these are submitted for peer review. Peer review involves a panel of at least 3 additional veterinarians editing submitted content for accuracy, relevance, and level of detail. Only the best content is approved and then sent for editing by professional copyeditors who identify and fix typographical and other errors. The final layer of approval is veterinary review of the fully-edited content at the VetPrep site. VetPrep Certified™ Content Ongoing Review: On an ongoing basis, veterinary specialists are invited to review the content in their area of expertise to ensure that it is appropriately thorough and accurate. They update any information that may have changed since the content was originally submitted. They then make additional contributions of new content in areas that they feel would benefit from additional coverage. That new content must go through the review process described above before becoming VetPrep Certified™ Content. VetPrep Certified™ Content Item Analysis: On an intermittent basis, VetPrep has a statistician with expertise in curriculum assessment provide a statistical analysis of the VetPrep content. This involves a detailed analysis of user data for each question and answer choice, which allows identification of potential problems such as poor distracters, confusing questions, or other content issues. This data is utilized to perform targeted content review. VetPrep Certified™ Content User-Triggered Review: Whenever a user contacts the VetPrep support team with a question about our content, this triggers review by an expert in the appropriate field. They not only respond to the user to clarify their question but can submit proposed modifications to existing VetPrep content in real-time for review and updating. Students registering for the 90-day VetPrep course between May 1 and July 15 will receive access to VetPrep through the end of the Nov/Dec 2019 NAVLE® testing period (up to 244 days of access - the free extension is a $250 value) instead of the standard 90-day subscription length. The sooner you subscribe, the more time you have to study and the better the deal! The additional subscription time is great for students who wish to get an early start on their studies. And now with the brand new Pile of Done™ available with VetPrep Premium, you can go through all of your questions again and again. We do recommend that VetPrep is most heavily utilized in the three months leading up to the NAVLE®, thus we urge students registering early to pace themselves so that they can continue to take review questions leading up to their NAVLE® date. In the first few months of this special subscription, students typically take advantage of PowerPages™ and PowerLectures™ (VetPrep Premium).